What does your kid "Wanna-be"? We homeschool on a budget. I try to keep my homeschool spending below $350 a year for all 3 of my students. For product I am going to tell you about, I would gladly spend $8.95 out of my budget. Last month I was given the opportunity to try out one of the “Wanna-be” Series of E-books that are published by The Old Schoolhouse Magazine. It is a 10 book series on different jobs that kids often say they want to be when they grow up. The titles available include : Veterinarian, Police Officer, Artist, Pilot, Chef, Doctor, Missionary, and in the Military. 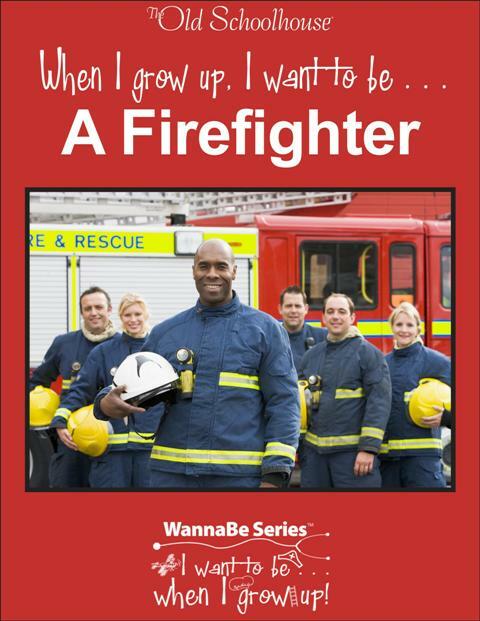 The E-book I received was “I Wanna be a Firefighter”. I was excited to start on it, because I thought my son might enjoy learning about what a firefighter does. The E-book was easy to download. It opened right up in my Adobe Reader. They are created to be used by a wide age range, 4-10 years old, my son is 7 and falls neatly into the middle of that range. I realize that part of the reason we have created E-books, is to save on paper, BUT…………… I printed out the entire 78 pages before we started, ( what can I say…..I am a hands- on kind of girl ) , and stuck it in a plain file folder to keep it together. I was amazed by how much “stuff” was in it! Over half the book is devoted to reinforcing activities and materials…. they even give you answer keys! There was copy work, both for manuscript and cursive writers, coloring pages for younger children, a word search, math, a test on the material that was to be read, bible verses, vocabulary words, activities and party ideas….. It is entirely self contained, you don’t need to purchase anything else, or look anything up…. just print what you want, and GO! We used the book for one on one instruction for my elementary school aged son, but I could envision how easily the book could be adapted for use in a Co-op setting, or for those with a large family. The many activities that are listed, to help reinforce the character qualities that are required for a firefighter would work best with multiple children. My older children ( high schoolers) were not so excited about participation, but if they were put in charge of younger children, and had to teach and supervise the activities, I believe they would have enjoyed it much more. My 7 year old, however, enjoyed the activities immensely. His favorite was the bucket brigade. I also think that the party ideas would be enjoyed more, if done in a co-op setting. We began the study while we were traveling in a car to visit some relatives. My sister was driving, and the rest of the car was captive. As I read, I was impressed by how thorough the material was. It was more in-depth than I expected for a K-4 material. Everyone in the car, my high schoolers, my son, and even my 31 year old sister, were engaged and interested in the material. Each subsequent day we would read another section from the reading material and do one or more of the reinforcing work pages that were included. It would take about an hour during our normal school time. Twenty to thirty minutes to read the material, thirty minutes more to do the pages, and discuss what we had learned. It tooks us a week and a half to complete the entire book. There was only one section in the book that seemed to be a bit “rough” in how it tied into firefighters and what they do. That section was Science. It was on robots. While there was an attempt to correlate: one robot was fireproof and was there to detect forest fires, another was one that could extinguish fires in chemical plants, this information amounted to only 2 paragraphs tying robots to firefighters in the 9 pages of the science section. Every time a robot and a fire were mentioned together, I would have a mental picture of a poor melted pile of microchips that gave it’s dying whir to help a fireman. I would have enjoyed learning more about the science of fires. For example: how does oxygen feed a fire?, what benefits or harm do forest fires have on our environment?, what types of plants need fire to reproduce?, how do investigators tell where a fire started and what started it?, these are the things I think of when I think “fire science”. Don’t get me wrong…. my son enjoyed learning about robots and building the robot arm, this section just seemed disconnected from the overall theme of the book. We really enjoyed this E-book. My son makes sure we either drive or walk by any fire truck that is parked at the grocery store. We go over all the gauges, hoses, ladders, and he tells me who sits where in the cab. 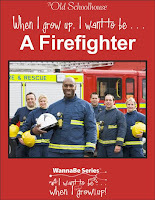 He originally didn’t want to start the material because he thought that if he read about what a firefighter does, he would be automatically committed to becoming a firefighter. After explaining that we were just going to learn more, not make a life long commitment to it, he relaxed and enjoyed all the new information. The material is easy to reinforce since we see firefighters living, driving and working in our community. I am pretty sure that it won’t be too long before he tries to talk me into chasing down a fire truck to see how it hooks into a fire hydrant and pumps the water to the fire. I would recommend this book, not just to those within the homeschooling ranks, but to everyone! Grandparents, Aunts and Uncles could use it when younger relatives come to visit. It would be easy to take on vacation and incorporate field trips into. Those who school outside the home, could use it as a supplement during holiday breaks or summer vacation. It would make a GREAT birthday gift. So, ask your child what they think they may “Wanna-be”, get one of these great E-books, and explore together more about what happens in their “dream” job. A quick review on Teaching Textbooks. First let me say their name is beyond boring… but they went to MIT… brilliant in math… lacking in the loquaciousness… we will forgive them..
Up to this point, we have used their Math 7, Pre-algebra, Algebra 1, and Geometry. I am waiting for Math 3 to come out so I can begin it with my youngest child. I have one child who just “gets” math…. the other, is like her mama…. and struggles with math over all. Both students enjoyed these books. My oldest, ( and the one who “gets” it) was able to come from public school 6th grade math, and then a year of no math, straight into the Algebra 1. I don’t mean to say that this Algebra course is that easy, because I do believe it to be academic. I feel he had such success because the concepts were made clear, in every lesson. I tried to do Pre-Algebra that same year with my math struggler, and it was melt-downs and tears. So we went and printed out the placement tests they provide, and moved her to Math 7 for a wonderful tear-free year. I do like the fact that my children can work independently with their math curriculum, and come to me with questions vs. me standing there reading out of a teachers manual and explaining all the concepts. I think that when you home school multiple grades, you need to take the opportunity to let your children work alone from time to time so that you are available to help your other students. These books do a very good job of explaining the concept, and they provide either CD-ROM lectures, as well as the lecture written in the book. It is a nice tool for those who are more auditory in their learning process. I learned things myself in Algebra and 7th grade math, that I was never taught. I feel like it filled the holes that were there from my own math education in “traditional” school. I have read dissenting opinions on this curriculum, and I do know if it is “behind” or not; I do not hold a degree in Math. To me, some of the word problems tend to be repetitive within a chapter, but it does the job of cementing the concept. It is expensive, however, I do plan to use the books with all of my 4 of my children, making the cost more like 50.00 a kid. I have noticed that re-sale value on this curriculum remains fairly high, should you choose that option to recuperate some of your expenses. If you have a math genius, maybe this isn’t your curriculum… But if understanding processes, and actually enjoying math is your goal…. these are the books for you.